Pioneers in the industry, we offer rudraksha musk incense sticks, rudraksh mala incense sticks, sandalwood agarbatti and rudraksha maya natural masala flora sticks from India. 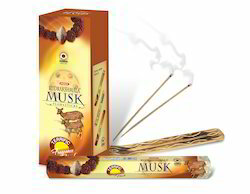 Rudraksha Musk Incense Sticks are made with the ingredient 'Musk', this fragrance will initiate such mood which help you in study and other work. Musk is considered to be a superior quality perfume which is a tonic for the heart; a cure for "melancholy" and "vapors of the womb; and a general safeguard against weakness and disease. With the help of our vast experience, we are broadly engaged in offering superlative quality of Rudraksh Mala Incense Sticks that is offered in varied fragrances as per the requirements of our customers. 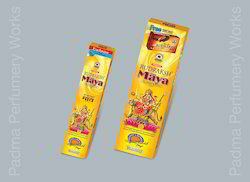 These incense sticks are processed using quality assured basic material in tandem with globally accepted norms of quality. Widely demanded in temples, the entire range is thoroughly tested on varied parameters of quality to ensure its premium quality. 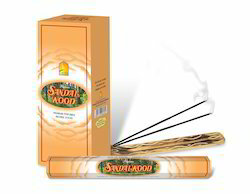 Moreover, our customers can avail these incense sticks at reasonable price. With hard-earned experience of our qualified professionals, we are engaged manufacturing, exporting and supplying Sandalwood Agarbatti. Known for its soothing fragrance of sandal, offered agarbatti is processed from the natural ingredients along with modern machines following the all standards of market. Also, this agarbatti is strictly checked by our quality controllers so as to dispatch a quality assured range from our side. 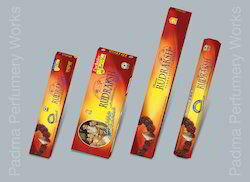 This agarbatti is offered to the customers at market rates in different packaging options. Understanding the diverse requirements of our esteemed clients, we are broadly instrumental in offering a wide range of Rudraksha Mayan Incense Sticks. The offered incense sticks are quality tested on various parameters in order to deliver flawless range to our esteemed clients. 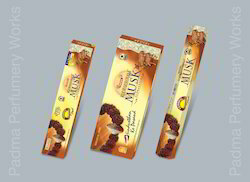 Furthermore, these incense sticks are precisely processed using fine quality basic material and innovative tools and techniques, in compliance with predefined guidelines of norms. Looking for Rudraksha Incense Sticks ?